I'm sure most of you have seen this little saying. I know I have, and I've sort of chuckled at it. 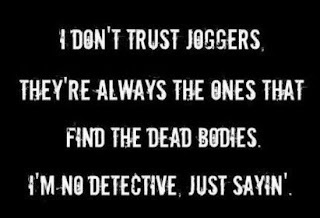 Of course, I'm miffed by the word "joggers" instead of runners, but that's just me. 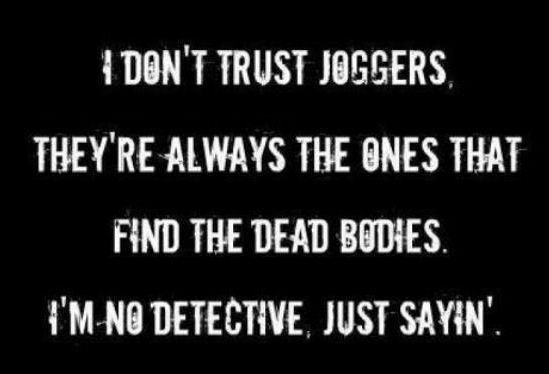 And of course, you hear the stories in the news all the time, "Joggers discover body." Well, today, that happened to me. I was with Amy, and she was chatting away. We were going pretty fast, so I was mostly concentrating on just running. It was about 6:45, so the sun wasn't fully up. I noticed a man laying off to the side of the path, in a small ditch area that has lots of landscaping, natural plants and such. There's a lady out there most mornings tending to the weeds. Anyway, I vividly remember thinking that it just didn't seem right. I mean, we pass vagrants often enough. They're usually asleep with a knapsack, clothes, something. And they usually look more comfortable. This guy's clothing was clean, he had no belongings around him, and he was laying quite awkwardly. I tried to move over to the farthest side of the path. I didn't want him waking up abruptly as we went by. Amy never noticed, and I didn't say anything. Not sure it would have mattered if I had though. I wouldn't have gone over to touch him, to see if he was alive. I didn't notice any blood, but again, the sun wasn't fully up. I'm glad I didn't notice. When I saw the news article online, I just got sick feeling to my stomach. I'm honestly reeling from this. I saw a dead man. I saw a dead man, and I didn't stop. I know, there's nothing I could have done other than call the police. But again, I don't know that I would have tried to wake him. This was most definitely not the post I had intended on writing today. And I guess I'm only blogging about it to try to get my head wrapped around the situation. I know that I won't run that route alone again. Of course, the man's death had nothing to do with me running and where I run. He wasn't a runner out on a morning run. It wasn't a female either, so I don't feel threatened exactly. Just really freaked out (for lack of any better words right now). This was a run I will never be able to forget. 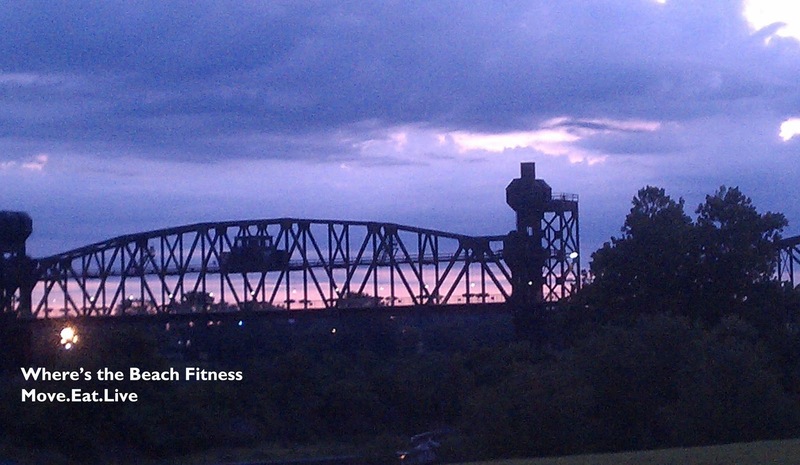 I'm going to do my best to try to remember the sunrise that we did see.